The threads under this category will depict the errors / bugs and issues encounter while working with OBIEE 11g. OBIEE 11g upgrade has a lot of issues and among couple of them common is on Conditional Formatting . This emphasis that even if the Catalog upgrade is successful there are some of the problem still persists in XML conversion engine of the Upgrade Assistant(UA) leading though several catalog defects due to malformed XML . This is another example as my upgraded 11g charts failing to show its conditional formatting which is was working perfectly in 10g …. This is malformed XML generated by UA during the upgrade of 10g code .If we look into 10g Advanced XML this is actually decimal but for some reason UA failed to put correct literal against it . 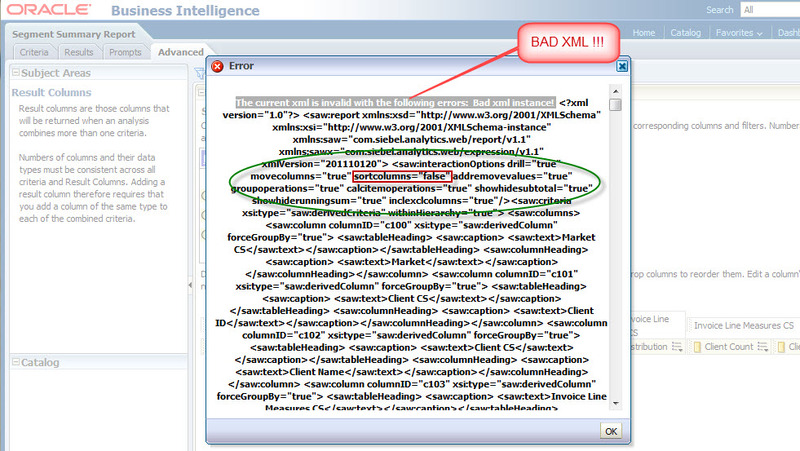 “The current xml is invalid with the following errors: Bad xml instance!” is very unusual error but when this has been encountered it is become frustrating as it sounds the entire report can’t be saved ! I remember last time I had faced the similar issue in 11.1.1.3 version while I was building a new report from scratch . The error enforced me not to even edit the reports so I neither I can move to criteria nor I can save this . That was weird ! The only option left was to edit the XML using Catalog manager but until and unless you know where the problem lies you can’t fix it right ? so the bug is around the green circled tags !! Reason is whenever you un-check some options under “Analysis-Properties” it will throw errors !! Probably this is some problem with the up-graded code in 11g from 10g as I tried to replicate the same creating a new reports from scratch which was pretty cool and removing any interaction works perfectly okay in the dashboard report . Edited the XML and moved it from beforesection to the end of all. 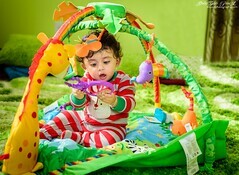 As it is combined request hence several would be present but placed it after all of them. After that apply the changes in Advanced XML and voila …. your problem fixed ! Note that this could be the one of incident with BAD XML error and probably you can found it in several other places with no relation to my above fix note . This those cases you need to dig down into more details of the Advanced XML generated and fix those issues as applicable for your case . I could report all of them in below threads with the possible resolution but as I am writing this blog now (actually I am bit late posting this thread L ) some of them already taken care of in 11.1.1.6 version however not all and bit surprised that though Oracle agreed to release the patch in .6 version and file the bug report they didn’t work out yet on those mentioned issues reported during .5 up-grade. Worth to see the link here for possible changes in BI reports due to new features before taking the assumption that it is a bug. As par my latest up-gradation from 10g to 11.1.1.6 is concerned it went well but still some of the defects which are already noticed in .5 not fixed yet, some of them appeared new and some of them totally ridiculous and critical too as per business perspective and some of them not reported yet to Oracle and hence no relevant information found in Support. Up-gradation of RPD and Catalog separately could cause the issue with the Dashboard Privileges and Object permissions. I had experiencing the issue when upgrade the catalog first and then RPD and reason which I could think of is that until the RPD up-gradation completed successfully by the UA it doesn’t going to reflect all the Users/Groups information in the Weblogic Security store. So if you are experiencing the issue recommendation is to at-least perform the RPD first and then catalog. Upgrade can’t be done if the parameters are locked in FMW EM console: Upgrade will fail with below status. Need to release the lock and retry. Take extra caution when you are enabling the RPD Read only option in the EM as I found this is quite weird but finally checking and un-checking multiple time resolves my problem. So there is possible bug around this features in .5 didn’t try the .6 yet. Never try to deploy the RPD using the undocumented and wrong procedures except from EM .Otherwise you will find “CSK Key not found” issue during RPD deployment process. Missing Application roles in catalog results the new roles to be created inside Weblogic Admin Console and map to the groups i.e. required. While changing the password of Administrator account in EM and Weblogic make sure both are in synchronize. Loglevel Bug – NULL loglevel value set against user in external table based authorization scheme cause the user login failure however the same configuration in database level works perfectly okay with 10g setup. Resolution is to have must non-null values against all users in database records. This persists till .5 version and did not check yet the .6 version. ApplySession failed during prerequisite checks: Prerequisite check “CheckActiveFilesAndExecutables” failed. Resolution is to change the Privilege of “C:\Program Files\Oracle\Inventory” directory from read-only to Read-Write with Full-Control . However that was never documented in Oracle OPatch Readme. While changing the BISystemUser password make sure those are in sync with EM security store and Weblogic Console and till .5 version there was issue with using special character as BISystemUser password. Make sure that it should not have special characters. “Act As” doesn’t populate the list of users and throwing functionality disabled by Admin. For Act As to work for the LDAP based users required configuration needs to be done (except what is the to-do configuration for 10g) as the security model for 11g is different from 10g. I will detail the change in “Act As” process in separate thread. There are always problem with the report or prompts decimal issues .Either new decimal value appended , decimal value missing, 3 decimal places appears in place of 2 or decimal values not appearing at all in Charts mouse over option. Also the issue persist in aggregate calculations which possibly results the wrong value in Sub-Total or Grand total. The problem needs to be diagnosed and isolated before fixing. Upgrade Assistant (UA) not really able to up-grade properly the navigated links/interactions against column header, value name and hence post up-gradation we had to manually remove all the unwanted navigation paths from column values. This typically occurs if any column of the table/pivot view has interaction, it is going to add the same interactions/Action Links to the measures columns across the reports. Typical problem has been faced in the Aggregate calculation and the conditions specified in the pivoted report. Those have been faced case by case. There is severe issue with Count Distinct measures specially to calculate the Grand Total and results the calculation mismatch between 10g/11g reports. Sorting of columns having the hard-coded customized values not works for Combined request. Special tweaking needs to be done to fix the issue by appending some space characters once, twice, thrice etc. Problem with SQL_TSI_WEEK function and Can’t properly cast the value caused CASTing errors. Not sure if that fixed in .6 version and not tried yet. Redundant Legend for Chart View in OBIEE Pivot and Table based Charts causing the weird legend display. 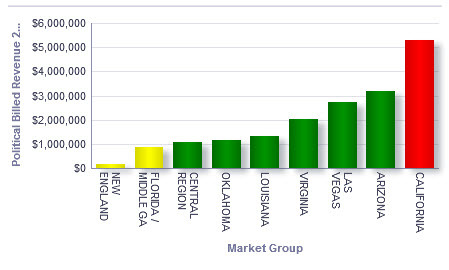 However part of that has been fixed and still some of the customized charts the issue retained in .6 version. 45 degree angle Chart axis label causing blurred labeling which is un-readable and pretty difficult to understand. Support suggests ‘EmbedFonts’ tag under instancconfig which also doesn’t help and I have seen the problem still persists in .6 release. In .5 release if we want to remove some column from the view of the table in Dashboard page it was possible but you couldn’t add those later and never find those removed column. But it seems that Oracle fixed the issue in .6 release. Critical catalog issue has been observed while Navigating from the Chart or Pivoted Chart where the value in the database having & character like (‘HOME & BEAUTY’) .In those case navigation to the detail report caused no results as the value itself from the chart passing to DB is like ‘HOME & BEAUTY’ in the where clause of the query. Didn’t got any response yet from Oracle about the fix and the patch. Latest Update(June/08/2012) — Oracle agreed the defect and raise the priority bug fix with no estimated SLA .However the issue escalated and waiting for Development team response. They also confirmed that the same issue will be there while Drill down from data value having special characters (like ‘&’) . In Chart pivoted result one of the metric value which is NULL, appeared in Pivot table and not in Chart for 10g, but in 11g it is coming for both Pivot and Chart . No solution apart from segregating the view into new Chart view. The expression like “CAST(((max(saw_3 by saw_1) /max(saw_4 by saw_1))*100) AS VARCHAR(50)))” no more valid in 11g at-least in .5 version. BI Publisher issue in one of the up-graded report as “oracle.xdo.XDOException: oracle.xdo.XDOException: Unable to create saw session. Please verify the server connection” and entire report needs to redesign for that using different security approach. Sometime it will be seen that until the Results tab returns the values if you bring the column from presentation area to criteria it will not reflect and sounds like column not added yet .However after results returns come back to Criteria you will see the column added. There are possible synchronization issue which still persists in .5 and .6 version. In 10g we can press Control from keyboard against the presentation column and the filter condition pop-up can be appeared automatically but same feature doesn’t exist in 11g .This could be a future and very useful enhancement request. In 11g .6 version has some issue with the Saved Filter post up-gradation and clicking on that filter view doesn’t pop-up the filter criteria and even the view doesn’t display anything in Dashboard page if we clicked it. However building the Saved filter from scratch resolves the problem. So issue there in catalog copy post .6 up-gradations. The problem identified later with the Integer value based column in filter criteria and the resolution is convert that to advanced SQL based values and that will sort out the problem . This is definitely another 11g .6 version bug. In some of our Charts we have seen there is display issue in IE8/9 and Chrome but not in Mozilla Firefox after up-gradation . However re-creating or building the same using IE8/9 browser fixes all the display issues and it is working perfectly fine. Also in some situation I have observed creating new view doesn’t help, in that case bring the attribute from presentation once again and create the derived expression once again and that sorts out the issue. In one of our request we have found the partial data issue/mismatch with Combined request with Union . After digging into the details it has been found that the issue is due to a calculated column in pivot section (whereas the same view didn’t have any calculated column in 10g !!) .The issue is bit strange . Deleting the unnecessary calculated columns/ or recreating the same view from scratch caused the issue fixed. Couple of the iBots not properly up-graded by UA and cause Bad XML instance error while executing the same. Even those iBots are not editable and can’t be saved during the XLM error. Support bug opened for that but not sure whether it has been fixed in .6 yet. This thread will be updated frequently to add more and more defects observed and the progress/resolution for it . Also just keep eye on OBIEE 11.1.1.6.1 and 11.1.1.6.2 patches and the related bug fixes to be up-to-date ! [nQSError: 13043] Could not get repository password for CSF key ‘repository.MyRPD_BI0001’ from CSF:  The Repository credential does not exist. So above error you will be getting for incorrect deployment procedure of your repository. This is specially recommended during the env migration . However I have seen in the same env if you are doing the copy paste of the same RPD and rename it and then change the name in NQSConfig.INI it somehow works out fine. Again don’t try to Update Account GUID’s (FMW_UPDATE_…. under NQSCONFIG and UpdateAccountGUIDs under instanceConfig) and Deployment of RPD at the same time .It will give you erratic behavior. And in those scenario your RPD and Catalog name is always going to refer old name rather new one. As far the 11g release is concerned and ongoing experience to work with OBIEE 11g, among the several good features ,enhancement from all aspects there are a lot of glitches causing unnecessary itches for the Developers and also additional overhead from Administration’s perspective . Hey Weblogic , not a good friend yet with OBIEE 11g causing a nightmare for last couple of weeks while engaged in couple of migration project from OBIEE 10g to 11g .Overall experience is not satisfactory with this new planet …. Weblogic … in the Universe…. 😦 Lets make it simple and manageable… !! As per the 10g release is concerned using some conditional clause any NULL value could be presented as 0 specially when there is divide by zero scenario . In 10g it is pretty easy to handle such situation from RPD or Webcatalog but in 11g it is a proven bug . Oracle Ref: Internal Bug Id: 13054445 . Came to our notice in Pivot table operation neither the CASE WHEN in RPD/Catalog ,not the IFNULL or NULLIF handler able to replace the NULL value with 0 for my Pivot table. Forget anything to do in any of the config file or the database feature in RPD . Nothing will be helpful at all…If yes , your comments are most welcome ! Resolution: Nothing . Ask Oracle to get a patch if this is critical for you or wait till unplanned 11.1.1.7.0 release. In my recent execution of a OBIEE 11g development project several unforeseen events have been experienced which is either a product defect or an enhancement issue encompassing couple of 11g new features or the existing feature having enhancement issue. Most of them are from UI perspective and some of them from Repository perspective. I like to jot down those points that could be useful for future reference. All below issues noted are as per my observations that might not necessarily true as those depends on the situation and the environment where I have faced the problem. I am quite sure there will be tons of problems on the way while upgrading the 10g to 11g especially from the customization perspective and architecture perspective. 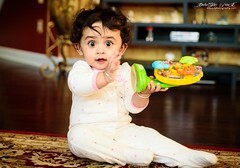 I will update it as soon as I will be facing such concern down the line …. ! Changed the expression and after removing IFNULL I can see “Is in Top” option vanishes. So you can’t choose numbers anymore that in which ranges it belongs to. While restarting BI Components (Presentation Server, BI Server and Scheduler) from OFMW enterprise manager console it suddenly throws errors at the end of restart process. However the log and other information are not meaningful but the entire things were up and running behind the scene. Not really sure about what is the meaning of the error. But it seems there is a communication delay between BI Server components and the Windows Process manager OPMN and once that delay is over all the components work perfectly in sync. Until OPMN also up and sync with BI components you will get error “Error 500–Internal Server Error” in bieehome page URL. 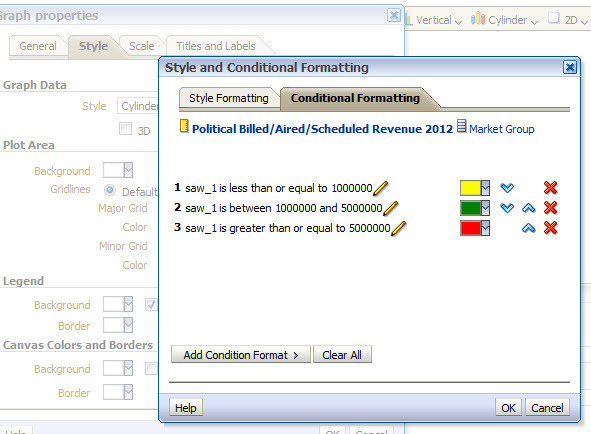 Alternate inner coloring in pivot table row format actually overrides the measure column format label color specifications format once that measure bring from column section to row section. While you edit the page all the hidden page also visible and can also be edited like changing the entire page layout components. I think this is intentional and not an issue rather it gives the flexibility of altering the components even if those are hidden in actual dashboard page. The dashboard page level slider prompt control took unnecessary vertical whitespace from the end of the prompts till the Apply/Reset button causing the much more vertical section space for prompt. So even if, inside the control it is specified that the Button will be placed to the side of the prompt it doesn’t behave like that. So I think this is a bug to fix. Editing the compound layout from the dashboard page layout where it is specified to expose the view for say “Compound layout 3” rather default compound layout it should open the Layout 3 in the edit page. But it is not the case currently and always opens the default compound layout. I know, even the components specific editing feature was not there in 10g as well. But as a developer we could expect much more on that which helps our life cool. I encountered intermittently “Bad XML instance” while adding multiple prompt values in report filters and it doesn’t allow saving that report. Don’t know the reason about it but once I log off and log back in again everything is fine and I can even add those prompt criteria’s without issue. OFMW Enterprise Manager console weblogic user is not case-sensitive and due to that reason when you enter using the user ‘WEBLOGIC’ say (all in caps though actual user is ‘weblogic’) you can logged in see all the pages and options and it allow to lock and edit the configuration button press. But once you click that you will see all the fields are still not editable and there will be no button called ‘ Release Configuration’ or ‘Activate Changes’ .So either it should allow all the functionalities or not allow to log into EM console at all . Changing the prompt text/label color and style will change the default section value of the prompt format as well. For e.g. if we change the prompt text color it will change the default value set in the prompt as well. Pivot table exclude is possible but not include in the non-designer mode. For e.g. once your report is ready and placed into the dashboard, right-click on some column and click to exclude some column from the pivot table display. You can do it. But you can’t get those excluded column back from the same section. 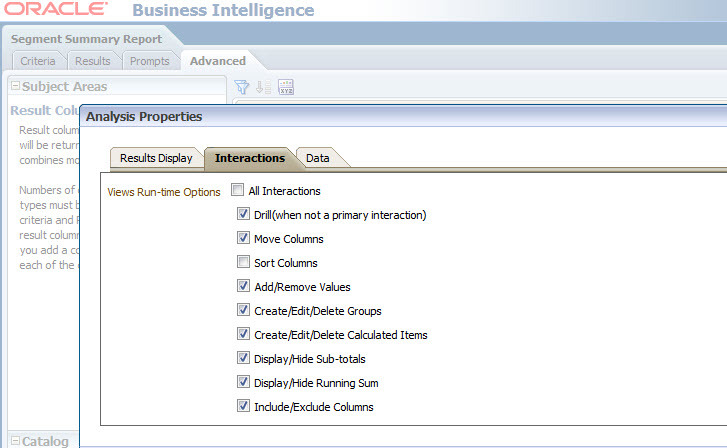 Instead of that you have to click on reset page display or ‘Clear My Customization’ to get those column back into the pivot reports. Add to briefing book option is not displayed even if it is enabled in the dashboard layout against the displayed components. The problem happens when, instead of displaying the default compound layout or other compound layouts you are displaying the view like ‘View Selector’ etc. OBIEE 11g User Interface (UI) Performance Is Extremely Slow with Internet Explorer 8 (- IE version 8 – ) .Follow my previous post to get the details. Due to the browser problem several issues like below you can find while developing your reports. ♦ Changing the colors of the measure attribute behaves erratically and it doesn’t reflect on time in inline view and once the reports have been saved it is back on color. ♦ Sometime compound layout views displayed only without any control activated and hence browser needs to be closed after log-off and only solution to log back in. ♦ Issue can be appeared in Style Formatting for Graph. The spikes and the pointers (triangle, round) doesn’t display correctly. [nQSError: 37005] Transaction update failed. And the resolution Patch 12909840 – GETTING ERROR:  INTERNAL ASSERTION: CONDITION M_LOCK.ISACQUIRED() available on request from Oracle. 11g RPD has thrown the error message while query on object from Physical layer and double-click that object to get the details.BI admin tool has thrown error “Object is orphaned and should be deleted”. The cause is unknown however I search the object and find it using pair of eyes and double clicking it is fine ! So weird no? I have not found any such error logged in Oracle Support and not sure about the reason. However the problem resolved after closing the Admin tool without saving the changes and re-opening it! Graph slider (11g new feature) causes some unpredictable issues if you like to play with it more and more! (changing the sort order , randomly moved the column across several places in layout view , changing the measure data/column format). I had faced some unpredictable issues and in place of Graph slider it displayed like an error with message and my slider control vanishes. However I got it back after 2-3 days after several restart. Might be a kind of rendering issue in IE8 is responsible for that. Now I switched to Firefox hence not having any problem until now. While adding the Groups (11g new features) inside catalog level, the values doesn’t change automatically until and unless Cancel button has been pressed. Once u click on Cancel button hold your mouse button and come to other section and release the button pressed you can see the value changed.